Tyka is a free client application that will meet all your online sim racing needs and more! Chat with your friends, search for available rooms, host a dedicated server, take advantage anti-cheat measures, compete in leagues: Tyka has it all! - Tyka supports the best racing simulations: F1 Challenge, rFactor and GTR2, with ARCA support coming soon. - Easily host and join rooms. A simple but powerful user interface makes it easier than ever to host or join rooms. - All mods and tracks are supported. Tyka uses an advanced gamescanner to search any mod or track you have installed in your game installation. 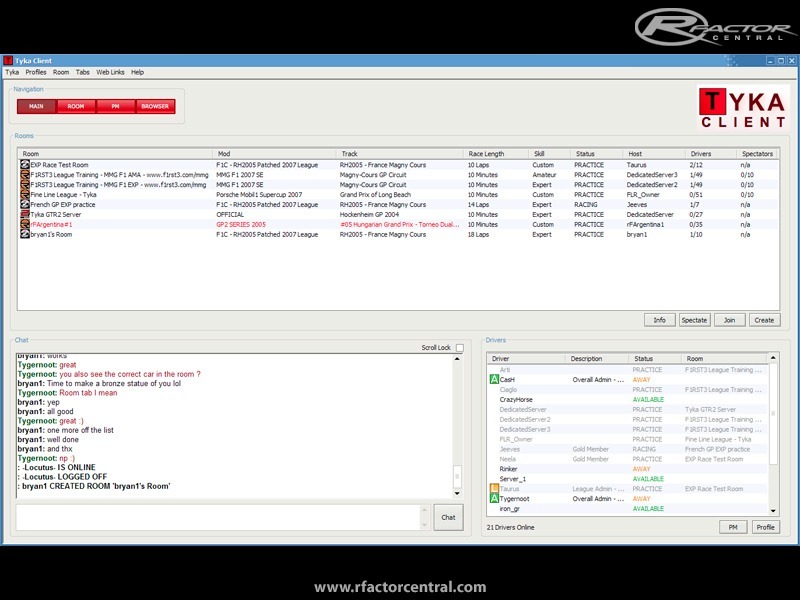 - Matchmaker and RaceCast compatible. - Advanced cheat checking system. Drivers joining rooms hosted on Tyka are automatically and continuously checked for file and ram cheats. - Chat with your friends through the open chat or through a Personal Message system. - Integrated webbrowser. You can browse the web from the client itself. - Auto-update. The client will automatically download and launch its latest version. - Spectate rooms. rFactor allows you to enter as a spectator. Witness exciting league races from first row. - Forced rFactor upgrades. You can select car upgrades when joining and force specific upgrades when hosting a room. - Auto-download for tracks. We put up a selection of the best tracks which will download and install automatically. - Set the game’s graphical options from the client. No need to launch the game. C_Phillips, we know the link isn't working. At the moment we have trouble with the data-center. They have to re-connect our server to the internet. We are still waiting for them. but we have had some technical difficulties. At the moment we are waiting for datacenter to re-connect us to the internet. hopefully all will be solved soon. The server it's offline days ago? Why? like you also asked in our forum (accessible for everybody through http://www.tyka.net) all have to join through Tyka-client for the anti-cheat to work. When using Tyka server edition to create a room and starting a sever, is it mandatory clients join through Tyka client or the anti-cheat function works even if they enter through server list in the game?